The reproducibility rate of preclinical is studies are continuing to garner increased attention as they are unacceptably low. 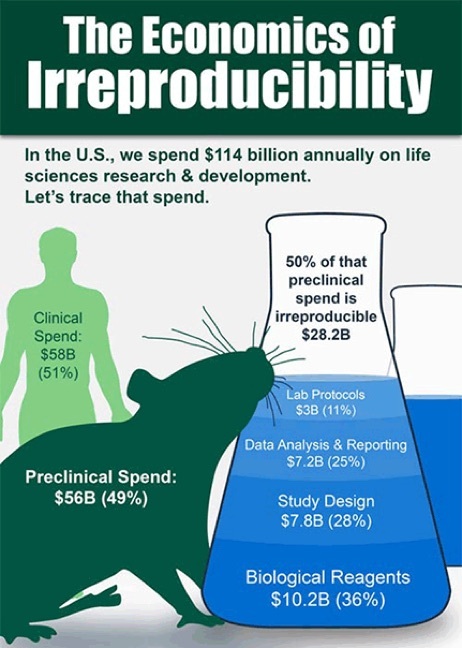 By some sources 51%-89% of preclinical studies are not reproducible. Considering how many resources are pouring into preclinical research these rates are unacceptable. Preclinical studies currently cost $56.4 billion dollars annually accounting for 49% of all life science research in the united states annually. When combined these statistics reveal that over $28 billion dollars annually are spent on irreproducible preclinical studies. The declaration of Helsinki – Ethical Principles for Medical Research Involving Human Subjects, requires trial registration for all studies concerning human subjects, ‘Every clinical trial must be registered in a publicly accessible database before recruitment of the first subject’. It jeopardizes the strategic advantage of drug developers by enabling free-riding on investments in clinical development. If the logic supporting good disclosure practice extends to preclinical studies, does it extend to basic science as well? Cost could be shifted to government regulatory agencies and funding agencies and away from investigators.